“We can fix the tickets before the factory comes in. We don’t need the hassle of trying to fix every ticket now.” Joe service manager said. I wrote this down as Joe said this because I almost couldn’t believe what I was hearing. But there it was, and I know there are others out there that feel the same way. 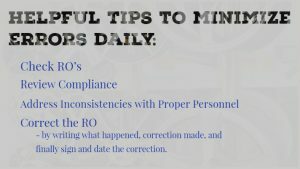 At AWN our mission is compliance checked and corrected on every RO before submission. It isn’t always possible but it is something we aim for. In doing that some service managers believe that we are “stressing them out” having to address concerns daily. Without staying on top of errors daily, the shop will be exactly in the same situation as Joe when the audit team arrives. It may be a year or two before you see an audit team so why stress out about every ticket? Just wait and fix the ones on the list they give you! Well by then it is going to be obvious that you are covering up your mistakes. Or here is something I have seen is many stores; The administrator brings a stack of claims to the service manager daily to approve stating, “Here are all the add-on repairs you need to sign. This stack is the one with all the straight time to approve.” Well heck! That is not the way the factory designed it. Without approving add-on’s or straight time as it is happening is like you approving that repair to your furnace AFTER the repairman has already put it in and given you the bill. If a contractor treated you this way, it would freaking make you mad and not want to pay the bill. The same attitude is taken by the manufacturer that is paying the warranty RO. You, the service manager, are elected by the manufacturer to be responsible for spending the money in their wallet. It is your job to be a good steward of their finances by making sure you inspect vehicles to make sure that added repair needs to be done PRIOR to it being done. Errors do happen daily- it is a fact of life. By addressing the errors daily, there will eventually be fewer and fewer mistakes as staff learns proper procedures. Note- this will only consume 30 minutes of your day by the end of the first week- I promise. You are in a much better situation when the audit team arrives and sees that you know the mistake, you corrected the situation, and you are training your people every single day. That is what they want to see in every service department. You are watching the money that is spent on their behalf.